Now based in Nelson, NZ, I have recently returned from an OE that just kept giving! I left for London with nothing more than a backpack in 1998. In 2014 I returned to NZ, settling in Nelson - now with a wife, 2 kids, 15 years of international adventure under my belt, and several shipping containers of stuff! Growing up the family got in to everything. Water skiing, snow skiing, tramping, cycling, running and the usual team sports. Mum and Dad did and still do set the example in that regard! Leaving home at 17 to move to the big smoke in Wellington I got in to Duathlons, Mountain Biking and Mountain Running, competing in the NZ Mountain Running Champs just before I left for London. New mates in London got me in to all sorts of great adventures. I have raced a fair few ultra marathons and marathons (with my Mum dragging me round my first marathon!). I normally manage to slog out a couple of ultras and a couple of city marathons each year. I've raced five 7 day desert ultras chalking up a 1,200km of desert running. I have raced the Marathon des Sables across the Sahara Desert, the Gobi March across the Gobi Desert, the Atacama Crossing across the Atacama Desert, the Jordan ultra across four deserts in Jordan and the Namib ultra across the Namibian desert. Mountaineering has also started to feature. I've knocked off a few Alpine ascents including Mont Blanc and the Matterhorn, along with several attempts on the Eiger. 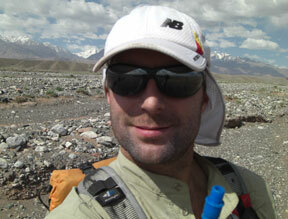 I'm always dreaming about the next big outdoor adventure and looking forward to the next summit. The day job is office bound - I'm a Barrister, having founded my own Barristers Chambers in Nelson. I've always wanted to get more involved in adventure racing and I was inspired to set up the MARCH to help other athletes, the sport and the next generation looking for a sporting fix. I can get inspired by all sorts of things - but I find myself thinking a lot about one of my best mates Greg Dickson who was killed in a plane crash in the Alps in September 2007. On the exact first anniversary of his death I stood on the summit of Mont Blanc and could see the path of his last flight. Greg and I travelled, drunk, ate and partied our way round the world for many years. We had the biggest adventures possible in some of the most obscure places. He always said yes, whatever the offer. I reckon that is pretty inspiring. Where would you be without your mates and companions in adventure?! You'd be stuffed! Lots of guys have helped me out in both respects above. Tom Beezer and Dave Fletcher have been a big help setting up the MARCH. Tom is the kit guru and the best guy to bounce ideas off – he'll already own the thing – and 5 more besides – and will tell you exactly why you need to own one. Dave is the best man to have behind the lens. He'll take photos that make you look like a pro. With Tom and Dave alongside you'll always have a cracking adventure!